We all know that broccoli is good for you and that an apple a day keeps the doctor away. We know that blueberries are chockfull of antioxidants and that eating wild salmon supplies you with enough energy to swim upstream—but what about sardines, capers, and coffee? Did you know that sardines are one of the best sources of omega-3 fatty acids? Capers are loaded with quercetin—a powerful antioxidant proven to combat cataracts and reduce the likelihood of some cancers. Even the consumption of poor, misunderstood, coffee has been shown to stimulate the brain by temporarily improving memory skills and reaction time. What follows is a list of some of the other lesser-known Superfoods—foods that don’t received as much press as apples and spinach but foods that are, nonetheless, just as super from a nutritional standpoint as those currently receiving celebrity status. Pumpkin – No longer just a decorative Halloween porch item—but a food proven rich in beta-carotene, the antioxidant responsible for reducing the risk of osteoarthritis and rheumatoid arthritis. Pumpkin also contains beta-cryptoxanthin, which may decrease the risk of lung cancer in smokers. The pumpkin is a classic American treat that lends itself well to a variety of cakes, pies, and dessert dishes. Oysters – First, make sure you cook ‘em. Raw oysters are sometimes contaminated with harmful bacteria. There are many ways to prepare oysters—Craft’s Tom Colicchio rolls them in batter, fries them, and serves them over a bed of creamy, tangy rémoulade sauce—may not be the healthiest version of this particular Superfood but certainly one of the most delicious. Oysters are packed with omega-3 fatty acids, which play a critical role in brain function as well as normal growth and development. Onions – Onions contain high levels of quercetin. Quercetin’s anti-histamine action may help to relieve both allergic and asthmatic symptoms. Quercetin may also help to reduce fatigue, depression, and anxiety. Onions can be enjoyed every day with meals. Although your partner might complain about the slightly pungent aroma—he’ll be glad that you are sneezing less and have a little more pep in your step. Sunflower Seeds – Sunflower seeds are a great every day snack. During the summer months, the sale of sunflower seeds spike due to the large number of baseball players and outdoor enthusiasts who enjoy this convenient little snack. Not only are sunflower seeds fun to eat—they are proven sources of the B vitamin niacin. This nutrient may help prevent cataracts, promote blood vessel health, reduce high blood pressure, lower cholesterol, and even relieve migraine headache. Kale – Kale is a leafy green Superfood. Since it has a slightly bitter taste, it is best to flavor it with spices. A horizontally challenged friend of mine even puts it in her lasagna and swears that she has grown 2 inches since she began adding kale to her favorite Italian dish. 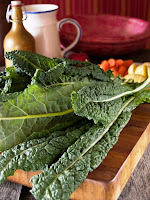 Due to the presence of certain carotenoids—Kale lowers the risk of cataracts. Due to its high amount of organosulfur—Kale is also a particular standout in warding off cancer. If that’s not reason enough to add kale to your diet—kale is loaded with additional nutrients, such as vitamins A, C, E, and B, as well as manganese, copper, calcium, and iron. Herring – Herring, a staple food in Scandinavia since ancient times, is one of the greatest sources of fish oil. An impressive list of health benefits provided by fish oil include its ability to aid in heart diseases, high cholesterol, weight loss, cancer, diabetes, arthritis, Alzheimer’s disease, eye disorders, macular degeneration, ulcers, and a host of psycho-somatic symptoms. Either by salting, smoking, or marinating usually prepares herring, like many other traditional Scandinavian foods. Red Bell Peppers – Though any color of bell pepper contains important antioxidants that help to ward off many illnesses, red bell peppers in particular may actually reduce the risk of lung cancer. Red bell peppers contain an orange-red carotenoid called beta-cryptoxanthin. A study conducted in China showed that smokers who consumed a beta-crytpoxanthin-rich diet had a 37% lower risk of lunch cancer. Red bell peppers definitely have their advantages. Not only are red bell peppers more nutritious than bell peppers of other colors (we won’t name names) but they’re also sweeter in flavor. Seaweed (sea vegetables) – Although seaweed has been a staple of the Japanese diet for centuries—western cultures have only recently begun to enjoy this low-calorie Superfood. Sea vegetables reportedly reduce the risk of heart disease, alleviate symptoms of stress, and assist in thyroid regulation. Dehydrated sea vegetables can be found in most health food and specialty stores and are frequently used in salads, soups, stews, or stir-fries. There is even a new faux-caviar gourmet product on the market that looks and tastes just like caviar but is made entirely from seaweed. Oats – A bowl of oatmeal can offer you much more than just a warm start to your day. Oats are some of the best sources of soluble fiber, which help to reduce total low-density lipoproteins (LDL) or “bad” cholesterol. A high level of LDL greatly increases the chance of heart disease. Oats can also help control blood sugar and digestion. Adding oats to muffins, cereals, and desserts is a delicious step in the right direction. This entry was posted in antioxidants, nutritional value, superfoods, vitamins. Bookmark the permalink.